Today the technological advancement has reached to a greater extent that many producers have become efficient enough in manufacturing high quality of Orifice Flanges. In the industry, the product is produced by using high quality of the alloy along with essential modern equipment. The product is available in various shapes, sizes, dimensions to suit the demands of buyers. 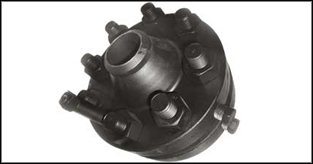 These flanges are widely used in industries because of its good qualities. Guru Gautam Steels as a customer oriented is also offering sales after and value-added services to esteem patrons for assuring long lasting relationships and have more deals in the future. To buy it at best rates, you can deal with Guru Gautam Steels; you will also get the product delivered well on time. Type of Flanges : Weld Neck Flanges - WNRF, Socket Weld Flanges - SWRF, Slip On Raise Face - SORF, Blind Raise Face - BLRF, Spectacle Blind, Ring Joint, Large Dia Flanges, Orifice Flanges, Girth Flange, Lap Joint Flanges, Screwed (Threaded) Flanges, Long Weld Neck Flanges, Reducing. Class : 150 LBS, 300 LBS, 600 LBS, 900 LBS, 1500 LBS, 2500 LBS ASA 150, ASA 300, PN 6,10,16,25, 40,64,100,160 ETC.